The Gods Are Bored: Where's My Gold Spray Paint? Another Year with the Two Street Stompers! Where's My Gold Spray Paint? Another Year with the Two Street Stompers! 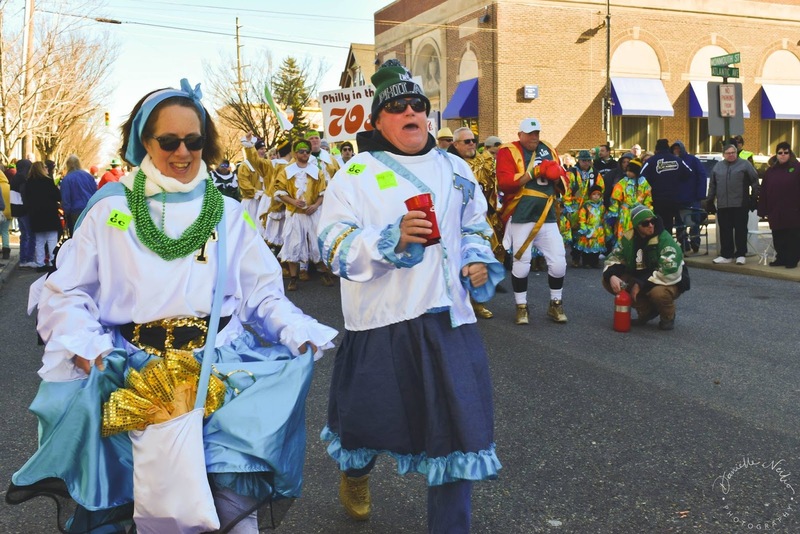 This tumultuous year is drawing to a close, and that means it's time for another Mummers Parade! 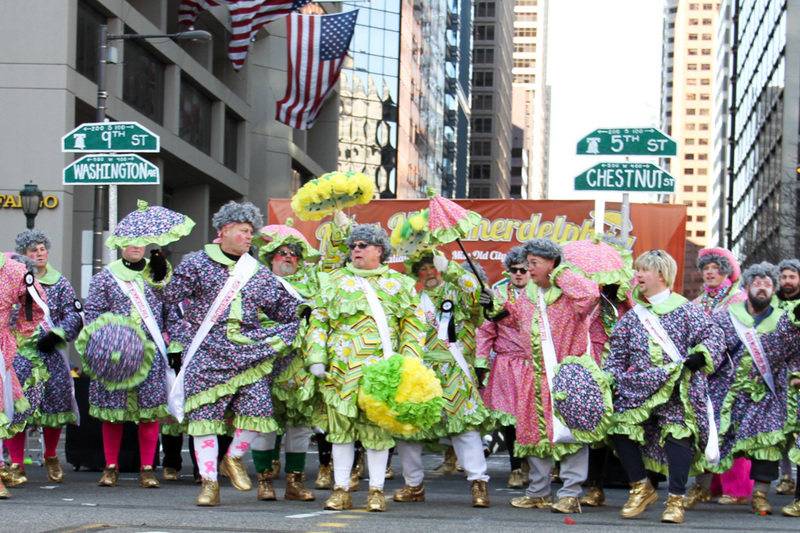 Philadelphia hosts an annual Mummers Parade on New Year's Day. For decades I would get out of bed on January 1 and turn on the t.v. and sit in a chair, watching the parade. "That looks like fun," I would say to myself. And then something shifted. Instead of saying, "That looks like fun," I started thinking, "I wonder how I could do that?" So I asked Doctor Google, I got some phone numbers, and in December of 2011 I found myself in Brooklawn, New Jersey at the clubhouse of the Two Street Stompers. 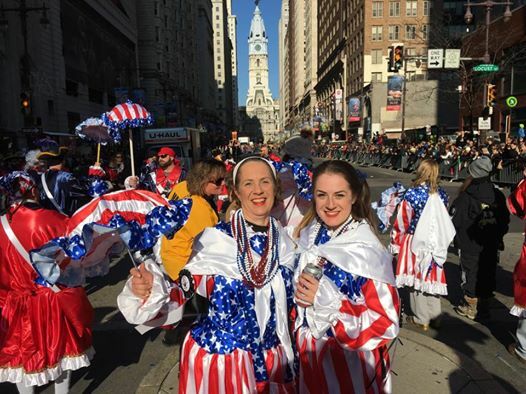 The Philadelphia Mummers Parade is a tradition that extends back 100 years or so and has its roots in South Philly neighborhoods. The Two Street Stompers have been marching as a club since 1978. They were one of the first clubs to have women members. When I joined the D.A.R., I had to fill out a huge, long form and get two members to endorse me. I had to meet the membership and prove I was of high moral fiber. I became a Stomper after a phone call. They didn't even need to eyeball me first. The fact that I wanted to strut was enough for them. 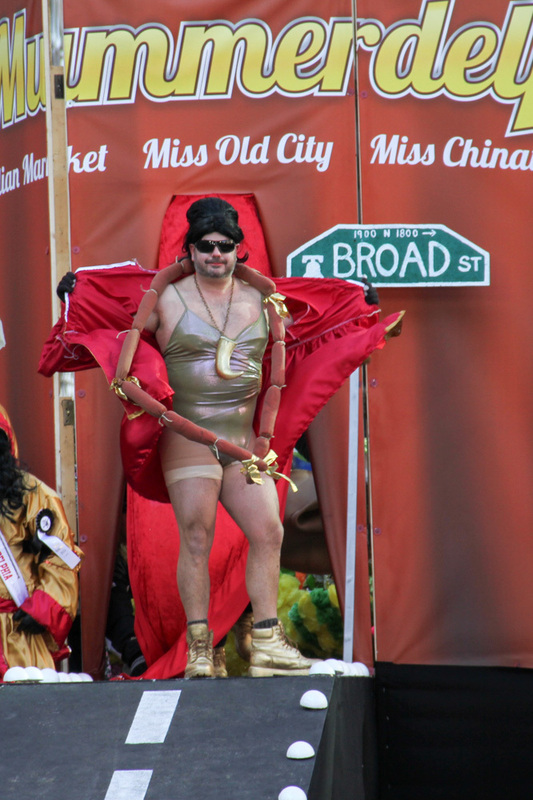 My three regular readers know that I like to sport fancy costumes. In this respect, being a Stomper is intensely rewarding. Every year I get a beautiful, brand-new satin suit that I get to keep ... and I don't have to make it myself! What a relief that is! This is our club in one of our first-place finishes. I helped to make the puffy parasols. I think it's fair to say this isn't the D.A.R. I've had so much fun as a Two Street Stomper. Originally I thought I would do it a year or two, just to say I participated. BAMP! Now I can't even imagine sitting in the chair and watching! 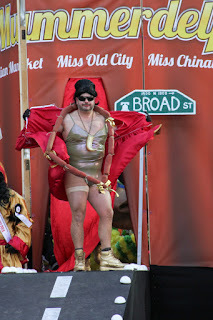 This is my favorite parade picture. That's me and my daughter The Fair. She marched with us twice. Look at City Hall in the background! Mind you, this is the first day of the year. The first. What an excellent way to launch another 365-day cycle! If you want to see last year's first-place-finishing routine, click here. We made the front page of the Philadelphia Daily News. It was 6 degrees with a stiff breeze. But hey. It's only once a year. I'm in the back, wearing a red ski cap. You can judge a girl by the company she keeps. The D.A.R. taught me that. more power to ya, girlfriend! at 6 degrees F, I'd wind up in some hospital on oxygen; my old lungs can't handle that! Your 8th year as a Stomper! Congrats! 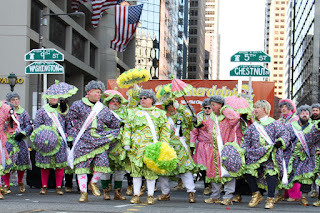 Such fab costumes and routines -- Go, Gurl, GO! Looking forward to hearing your report in the New Year about how the 2019 parade went!